Heart Health: Heart Attacks in the Young and Super Fit — How Can This Happen? Physical fitness doesn't make you immune to heart disease. This past February, Biggest Loser host and fitness guru Bob Harper, 51, lay unconscious for two days after suffering a massive heart attack. On June 30, 2007, legendary marathoner Alberto Salazar, 48, suffered a heart attack that left him technically dead for 14 minutes. On July 20, 1984, Jim Fixx, at the time the nation's leading spokesperson for the health beneﬁts of running, tragically died of a massive heart attack while running alone on a Vermont country road at the age of 52. These unfortunate events should be a wake-up call to all practitioners that physical fitness doesn't confer complete immunity against atherosclerotic coronary artery disease (ASCAD) and potential myocardial infarction (MI). How could this happen in relatively young, elite athletes? These men all shared common traits. 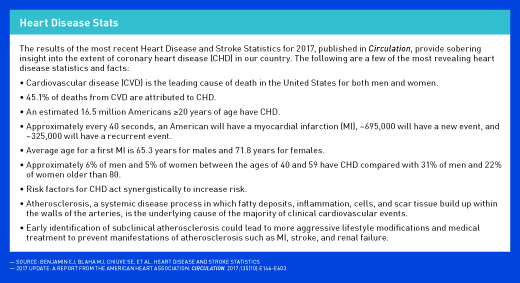 All suffered from ASCAD, the leading cause of cardiovascular morbidity and mortality in the developed world.1 Furthermore, a powerful and independent risk factor that each of these athletes had in common was a strong family history of heart disease. Harper's mother died young from a heart attack. One of Salazar's grandfathers died from a heart attack at 52, and another died at 70, also from heart disease. Salazar's father had two or three heart attacks, and he has one sibling who has had heart problems. Fixx's father died of a heart attack at age 43. Despite all the obvious advantages of physical activity in preventing CHD, it's shocking when a cardiac event occurs in well-trained athletes—and herein lies the paradox. How can an athlete succumb to heart disease when physical activity is supposed to prevent it? Experts have suggested that a cardiac event during physical activity may not be directly related to the bout of exercise but more likely associated with an underlying cardiovascular impediment most commonly associated with ASCAD.6 The exercise bout is the stressor that precipitates the MI in athletes with undiagnosed, unstable underlying ASCAD. 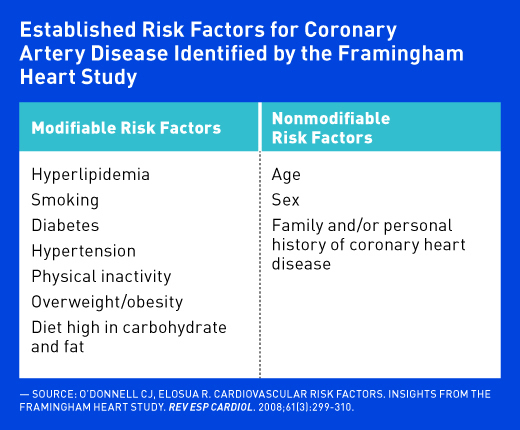 Dietitians, in conjunction with the patient's primary physician, should assess all major CHD risk factors and help patients reduce both the modifiable risk factors and identify and evaluate the severity of the unmodifiable risk factors. When assessing a patient's CHD risk, questioning the patient on family history is imperative yet frequently overlooked in clinical determination of risk. Simply recording a family history as a simple "yes" or "no" is an oversimplification that fails to recognize the effects of several variables within the parental history such as age of CHD onset.3 Patients with a high-risk family history should be referred to a physician to identify which seemingly healthy individuals may be in danger of an imminent MI before the event occurs. The good news is that on the horizon is a novel, simple blood test, which will help physicians identify which patients with and without evidence of CHD are at risk of heart attacks. According to Mayo Clinic research presented at this year's American College of Cardiology Scientific Session, the blood test analyzes plasma concentration of ceramides, a class of lipids highly linked to atherosclerotic processes.7 The study found that individuals with the highest level of plasma ceramides were three to four times more likely to have a cardiovascular event compared with those with the lowest ceramide score, regardless of LDL cholesterol level or the presence of blockage in the coronary arteries. 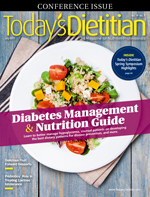 New research especially pertinent for RDs was presented at the American Heart Association's 2017 Scientific Sessions last March, which showed that a substantial portion of deaths from heart disease could be prevented by more healthful eating.9 In fact, researchers determined that eating a diet lacking in healthful foods such as nuts, vegetables, and whole grains, and high in salt and trans fats was found to contribute to more than 400,000 deaths from heart and blood vessel disease in the United States in 2015. Practitioners should assess CHD risk in all patients and prescribe a heart-healthy lifestyle for CHD prevention and treatment. Exercise is part of the lifestyle prescription; however, exercise doesn't provide immunity against an MI in people with underlying ASCAD and may in fact trigger an event. It's well established that parental history of CHD results in increased risk of the development of an MI, independent of other established risk factors.3 Dietitians should delve into a positive family history and evaluate the relative's relationship to the patient, the age of disease onset, and the number of relatives affected. Patients should then be referred to a cardiologist for more aggressive preventive therapy if the family history suggests high risk. — Janet Bond Brill, PhD, RDN, LDN, FAND, is the author of Cholesterol Down, Blood Pressure Down, and Prevent a Second Heart Attack. She's based in Allentown, Pennsylvania.